Power and torque, that's about all that needs to be said about the Hole-Hawg® line of drills. 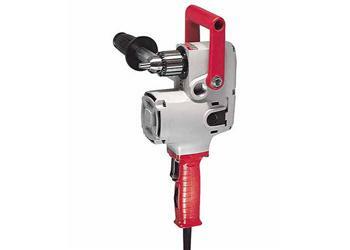 The compact design of this drill makes it perfect for drilling between studs and joists. This unit will handle up to a 4-5/8" Selfeed Bit. An extra long pipe handle helps you control the power. The 1675-6 features two speed ranges, 1200 and 300 rpm, this will greatly increase the versatility of this drill. Hi-torque and hi-speed make this the perfect choice for the heavy duty user.